Получила власть над природой от одного из членов Пантеона Титанов - Эонар. Когда Титаны покидали Азерот. Эонар Хранительница жизни (англ. Eonar the Lifebinder) - женщина с бронзовой кожей, ванир-титан. Она держит в руках алебастровый посох, у ее ног растут прекрасные цветы. Эонар - защитница всей жизни, природы и цельтельных сил во всей Вселенной и супруга Аман'тула Высшего Прародителя. Эонар испытывает отвращение к нежити, так как представляет собой воплощение жизни. Она не любит битвы и старается держаться от них подальше, играя обычно роль поддержки другим титанам Пантеона. Когда ее все-таки втягивают в битву, она становится зловещей и опасной. Она умеет как лечить, так и калечить, она может призывать землетрясения, адское пламя, грозовую бурю и многие другие катастрофические заклинания, в гневе этого Титана опасаются даже богоподобные существа. И все-таки она держится на расстоянии от противника в сражении, помогая в битве своим союзникам из Пантеона. Приблизительно 64,001 лет назад до Первой Войны Эонар отдала часть своей силы и духа красной драконице Алекстразе, чтобы та могла защищать жизнь в Азероте, и еще часть Изере для охраны природы и Изумрудного Сна. Изера (англ. Ysera) — Аспект Природы, зелёный дракон, младшая сестра Алекстразы, получившая свою силу от титана Эонар. Изера погрузилась в сон, называемый Изумрудным сном, который помогает друидам восстанавливать свои силы. Это не просто сон, а её царство — эфирный мир, в котором друиды находятся как бы в духовной оболочке, хотя физическое пребывание в нём не исключается. По сути, Изумрудный Сон является параллельным миром, в котором Азерот отображён как мир-идиллия, в котором никогда не появлялись разумные существа. Кожа Изеры блестит многочисленными изумрудами, а её физическая оболочка является эфирной. Изера очень редко открывает свои глаза, но когда это происходит существо, смотрящее в них, видит в глазах Изеры глаза всех живых существ Азерота, всех, кого он любит и ненавидит. После уничтожения Души Демона Изера вновь обрела былую силу, погрузившись снова в Изумрудный Сон. Ходят слухи о появлении Изумрудного Кошмара, который пытается свести с ума Изеру. Изера прям как супергерой какой-то. Трусы поверх штанов носит:) . Озвучка просто шик. В сочетании с музыкой, вообще умиротворяет очень. В очередной раз задаюсь вопросом к Близзард: - За что? Today, in this beta build she got her new model. She has a brand new model; it's the same type like Alexstrasza's and Sylvanas'. Except it has a green tint to it and different accessories. For a better view click here. Anyone know what shoulders she got on? Looks nice i really like her model she is the first reused model i actually like :S :\ Hmmm nice work blizz :D And why are her eyes open :? Alexstrasza, I never loved you. I just used you to get to your much hotter and younger sister, Ysera. Please don't call me. She has a belly button ring! After you turn in The Return of the Ancients, you can see the gossip options when you talk to Ysera. Tell me about the Shrine of Goldrinn. Goldrinn is the wolf ancient, known as "Lo'Gosh" in the Horde tongue. His tenacity is legendary. A shrine dedicated to him is in a basin west of the World Tree, but its keepers have fallen silent in the wake of the attack. I fear the worst. Before we can move on, you must save this shrine, discover the whereabouts of the wolf ancient, and beat back his foes. Aessina is the spirit of nature, my everlasting companion in both this world and the dream beyond. Her shrine in western Hyjal is at the forefront of the Twilight offensive, and may be ablaze this very moment. I have dispatched Arch Druid Hamuul Runetotem to the burned out husk of the Shrine of Malorne. He is behind the front lines, on scorched terrain known as the Flamewake. He is looking into how we can undo the damage, and investigating the whereabouts of the turtle ancient Tortolla. After you turn in Return to Nordrassil, you can see the gossip options when you talk to Ysera. Ysera starts the quest Aviana's Legacy if you cannot obtain it from her vision. yet the exact same clothes... just differently colored. now she just needs a unique dragon form like her big sister alex, deathwing lord of emos and narsasistic maylgos. Did anyone know she's actually blind ? Anyway dragon queens are hot . And they'r brothers are retards. The first one is trying to kill you and the second one wants to send you back in time to hug the dinasaurs or w/e. Hopefully (although very unlikely) we will be able to play night elfs with a similar looking model to hers (without horns ect...) because i think it's time older pre bc models got updated. Is it just me or does she look ALOT like Alexstrasza and Sylvanas? The armour they all have look similar and they're all hot. Anyone else notice that? I have to admit, her voiced lines in the Hyjal questing (specifically the lines about Alrysa and the returning Ancients) reminded me a lot of Galadriel's speech in the prologue to Fellowship of the Ring. Guys, does she have some kind of jewel on her belly? 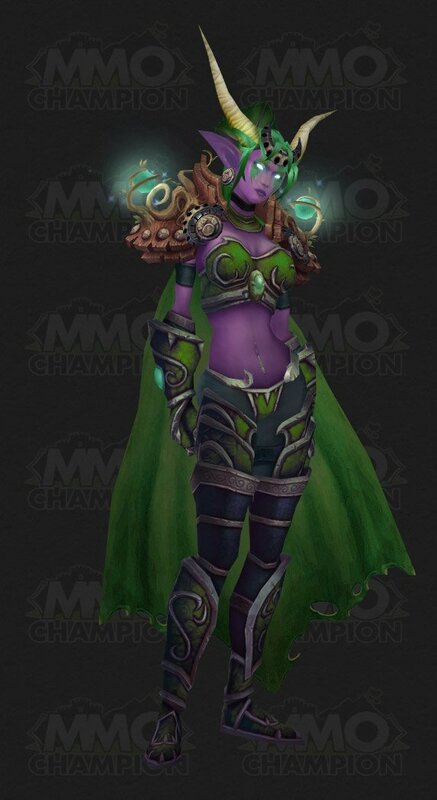 For those wondering why her eyes are open, it is because she woke up from the emerald dream (since the emerald nightmare is no more) so now she is known as Ysera the Awakened instead of Ysera the Dreamer. Satisfied that the small world had been ordered and that their work was done, the Titans prepared to leave Azeroth. However, before they departed, they charged the greatest species of the world with the task of watching over Kalimdor, lest any force should threaten its perfect tranquility. In that age, there were many dragonflights. Yet there were five flights that held dominion over their brethren. It was these five flights that the Titans chose to shepherd the budding world. The greatest members of the Pantheon imbued a portion of their power upon each of the flights’ leaders. These majestic dragons (as listed below) became known as the Great Aspects, or the Dragon Aspects. Aman’Thul, the Highfather of the Pantheon, bestowed a portion of his cosmic power upon the massive bronze dragon, Nozdormu. The Highfather empowered Nozdormu to guard time itself and police the ever-spinning pathways of fate and destiny. The stoic, honorable Nozdormu became known as the Timeless One. Eonar, the Titan patron of all life, gave a portion of her power to the red leviathan, Alexstrasza. Ever after, Alexstrasza would be known as the Life-Binder, and she would work to safeguard all living creatures within the world. Due to her supreme wisdom and limitless compassion for all living things, Alexstrasza was crowned the Dragonqueen and given dominion over her kind. Eonar also blessed Alexstrasza’s younger sister, the lithe green dragon Ysera, with a portion of nature’s influence. Ysera fell into an eternal trance, bound to the waking Dream of Creation. Known as the Dreamer, she would watch over the growing wilds of the world from her verdant realm, the Emerald Dream. Norgannon, the Titan lore keeper and master-magician, granted the blue dragon, Malygos, a portion of his vast power. From then on, Malygos would be known as the Spell-Weaver, the guardian of magic and hidden arcanum. Khaz’goroth, the Titan shaper and forger of the world, bestowed some of his vast power upon the mighty black wyrm, Neltharion. The great-hearted Neltharion, known afterwards as the Earth-Warder, was given dominion over the earth and the deep places of the world. He embodied the strength of the world and served as Alexstrasza’s greatest supporter. Thus empowered, the Five Aspects were charged with the world’s defense in the Titans’ absence. With the dragons prepared to safeguard their creation, the Titans left Azeroth behind forever. Unfortunately it was only a matter of time before Sargeras learned of the newborn world’s existence…. Might be just me though. I love both, Ysera and Dune. I'm aware there are few other references to Dune (not so) hidden within WoW, and I can't put my finger on why or how Ysera could be paralleled to Paul (or another Dune character), so maybe I'm seeing a reference because I want to see it. Nevertheless, I like the thought for some reason. Изера говорит: Древние хранители возвращаются. Кенарий, Авиана, Голдринн... Я чувствую их присутствие. Мы должны указать им сюда дорогу, ведь их помощь будет для нас неоценима. Изера говорит: Я боюсь за судьбу Алисры. Фэндрал стал порочнее любого кошмарного видения. И все же мы не оставим его. Изера говорит: Я сделала важнейшее открытие. Трещина, которая ослабила границы этого мира, также ускорила возвращение могущественных союзников.